Making colorful jewelry with friends is a fun, crazy and unique afternoon experience. I invited my girlfriends over to my studio and was surprised they all did so well; designing funky bold earrings, chunky cool bracelets and big statement necklaces. Some people are just naturals at being creative. When I showed my girlfriends how everything went together, they came up with their own one-of-a-kind jewelry pieces using the beads, buttons, charms and other cute trinkets I had available. I placed several pairs of pliers, lots of chain, eye pins, earring hooks and clasps on a long table in my jewelry studio, along with containers of semi-precious gemstones, flower buttons, silver charms and colorful fire polished czech beads to help with our afternoon of jewelry making. So with a little food, drink and lots of laughs we made some beautiful wearable fashion accessories. Updated Blue Diva Necklace shown above has plunging double layers of eye catching green and blue buttons that brings a bold edge to your style. Cool fashion buttons and flower buttons hang pendant style on long silver loops and adds interest to any ensemble, so impress everyone with your new original look. Cute Big Flower Necklace shown on the left has big purple and pink flower buttons connected in a unique jewelry design that gives your style an adorable bold look. This fun fashion accessory is perfect for bringing an outfit together. Candy Swirl Fashion Necklace shown on the left makes a statement with big buttons combined with donut beads and cute square accent beads. I design fashion jewelry for a big personalities, so your individual style is brought out with this original fun fashion necklace in teal and black with green and teal accents. 5 minutes and you'll look ready for anything. Sometimes people need to rethink their wardrobe choices when their life situation is changing. Always dress above what is expected then accessorize with bold earrings, big bracelets and fun statement necklaces and you’ll have people hanging on your every word. For example choose bold accessories to brighten those neutral ensembles that are always so much in fashion. With colorful fun jewelry your fashion style won’t fall flat ever again. Try big drop dangles, wearing a chunky charm bracelet, or have fun layering several bold necklace designs together and get yourself noticed by emphasizing the amazing individual you really are. Colorful handcrafted jewelry presents a bright welcoming look you need to connect with new friends and associates. So rather than buying all new clothing styles right away, use what you have and layer with colorful uniquely designed jewelry to revive your look. Original handcrafted jewelry will give you more choices while you slowly add new fashionable clothing pieces to your wardrobe. So dress yourself up with beautiful jewelry and get out there. 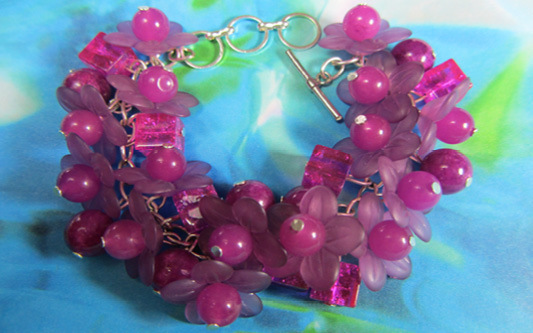 Divine Purple Berry Bracelet shown above has clusters of square, round and shiny magenta flower beads that sparkle in a smoldering retro hollywood style. Cute Rhapsody Flower Bracelets shown above and on the left in either yellow or teal and green have big colorful fashion buttons and flower buttons in a jewelry design that gives your style an cute, bold yet elegant look perfect for any occasion. Original fashion jewelry in bright bold colors creates a new hotter look for summer and turns wilting daisies into vivacious stunning divas. Add fresh new colors layered with fun textures to your look by shopping for one-of-a-kind handmade jewelry that adds spice to everything you already have. I always want to be surrounded by colors and styles I adore and that lighten my mood. Colorful uniquely designed jewelry always works as pick-me-up and an outfit that is drab can be rejuvenated with bold artistic and innovative earrings, bracelets and necklaces. So be your own artist and color yourself happy with to-die-for jewelry styles. So if you’re craving jewelry that’s boldly original and inspiring, shop for creative jewelry pieces from artists on-line and buy one-of-a-kind colorful accessories at great prices. When you find cool earring, bracelet and necklace styles that are bold and sophisticated wear them to weekend picnics and barbecues, but don’t forget work and evenings out too, because you're meant to shine everywhere. Cute Big Flower Bracelet shown at the top links big colorful turquoise flower buttons in a unique jewelry design that gives your style an adorable bold look. This fun fashion accessory is perfect for bringing an outfit together with bold diva glamour. Candy Swirl Fashion Bracelet shown above and on the left make a statement with big buttons combined with donut beads and cute square accent beads. I design fashion jewelry for big personalities, so your individual style is brought out with this original fun fashion bracelet in red with pink and orange accents or yellow with blue, green and orange accents.